Throughout the 1960s he was the unflappable safe pair of hands, equally adept at anchoring election coverage, moon landings, current affairs and global broadcasts. At the start of the decade he was the avuncular host who came into people's homes every evening on Tonight ("the next Tonight will be tomorrow night, until then good night") and ended it advising on the latest package deals in sunny Spain on Holiday 69. He's suddenly found out he's a father. Which is 16 stone lighter than his dad. The Daily Herald reported that Woman's Hour had rung Cliff to say: "It's no good, old man. Woman all over the country are badgering us to broadcast a few burps from your offspring. Can we send a microphone along?" Poor Jean found her stay in hospital shattered by photographer's bulbs flashing and the reporter from Woman's Hour immortalising baby Guy's first gurglings on tape. When Cliff left the BFN and returned to the UK it was as a freelance working for the BBC. On the television service he was both behind the camera producing shows such as the children's magazine All Your Own, presented by Huw Wheldon, Playbox and Johnny Morris's The Horse Chestnut Man as well in front of them on the children's shows Telescope, Westward Ho! and Junior Sportsview. For BBC radio he was introducing music shows such as Top Score and Housewives' Choice as well as providing sports commentaries. Indeed looking through the BBC Genome website throughout most of the 1950s and 1960s there's hardly a week where Cliff's name doesn't appear on either TV or radio either presenting, commentating or producing. 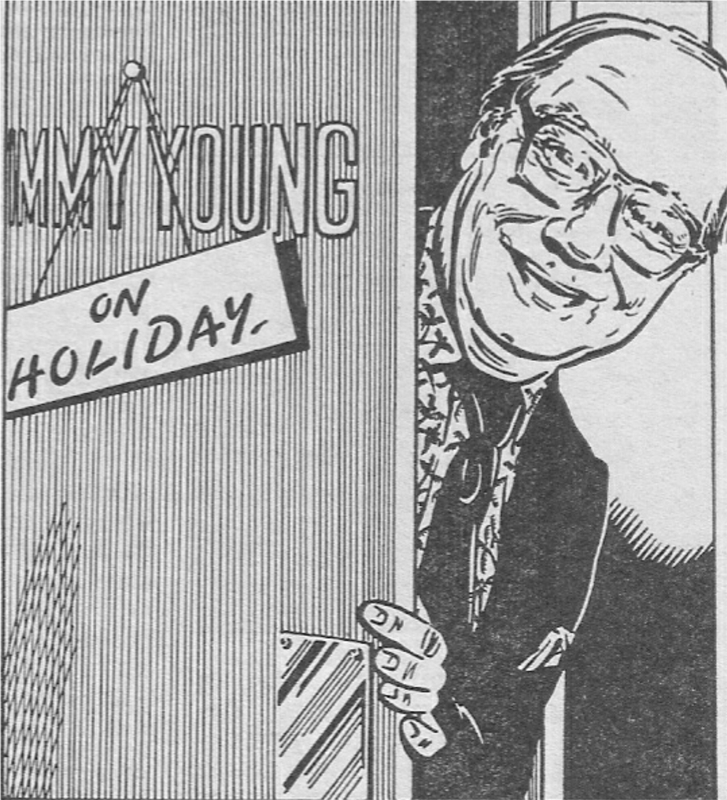 Cliff's break into mainstream TV came about following the arrival of ITV in 1955. The BBC decided to schedule a 20 minute Newsreel, news summary and weather forecast from 7 pm. leaving a 10-minute gap before the evening's entertainment kicked off at 7.30 pm. Producer Donald Baverstock jumped at the chance to fill the void and thus Highlight was born. Billed as "people, events, comments of today" in effect the formula was three short interviews, carefully balanced: "a hard interview at the start, a human interest story in the middle, and a pretty girl at the end". Woman's lib had not reached Lime Grove in the mid-50s. Initially the presentation duties alternated between Macdonald Hastings and Geoffrey Johnson Smith. When Mac gave it up Cliff was drawn in, apparently following an introduction to Donald Baverstock in one of the pubs near the Lime Grove studios. Cliff was worth his salt and readily adapted to this live evening broadcast. 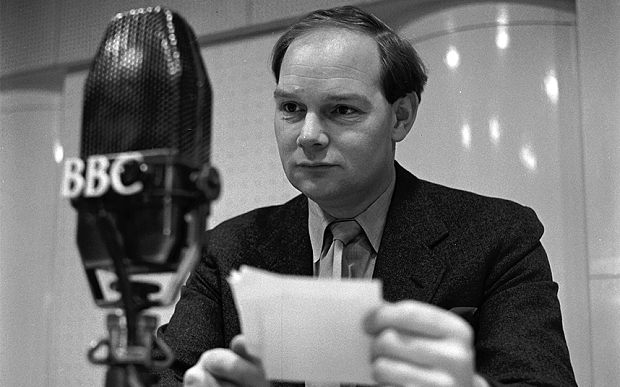 On one occasion, not long after he joined Highlight, the contents of an edition were the financial journalist Edward Westrop talking about the state of the economy, an interview over the circuit to Cardiff with Welsh author Gwyn Thomas about a new production of Under Milk Wood and rounding off with a talk to a young Scot who'd just won the World Ham Slicing Championship. The journalist's train broke down at Notting Hill Gate so he was a no-show, the line between Lime Grove and Cardiff went down and so Cliff was left with having to fill the time discussing the finer points of ham slicing. His only consolation was that he went home with copious amounts of ham! Working on Highlight Cliff also learnt a valuable lesson that stood him in good stead for the remainder of his career. It came about when he was lined-up to interview Krishna Menon, a Minister in the Indian Government, who was in London to have talks with Harold MacMillan and had also caused ructions at the UN over their stance on Formosa (as Taiwan was then known). Each of Cliff's question was met with somewhat enigmatic rebuke "That question is not cast in the mould of my thinking." Years later Cliff would reflect: "You cannot go into any interview over prepared. Under prepared yes, but never over prepared". By 1956 Cliff was not only working on Highlight but was still covering sporting matters on Today's Sport and Sports Round-Up was well as covering current affairs on Panorama. It was also about this time he acquired a new nickname. The story goes that he'd missed his train from Victoria Station and had retired to the Golden Arrow bar for a quick drink. He felt a tug at the bottom of his jacket, gazing up at him was a small girl. "Excuse me", she said. "Are you Clifflemore?" Answering yes she ran off and returned a minute later. "Clifflemore, this is my brother." He was carrying a bag of sweets and said, "Have a phweet, Clifflemore." At the end of the year the Postmaster General, Lord de la Warr, extended the hours available to television (following pressure from the commercial channels rather than the Corporation) by opening up the closed hour between 6 and 7pm, the so-called Toddlers Truce. Donald Baverstock proposed that the Highlight team, with Cliff as presenter, bridge the gap with a nightly show called Man Alive. By February 1957 that title had been dropped in favour of Tonight. The programme was to be "very informal and relaxed in manner, the tempo brisk and competent." 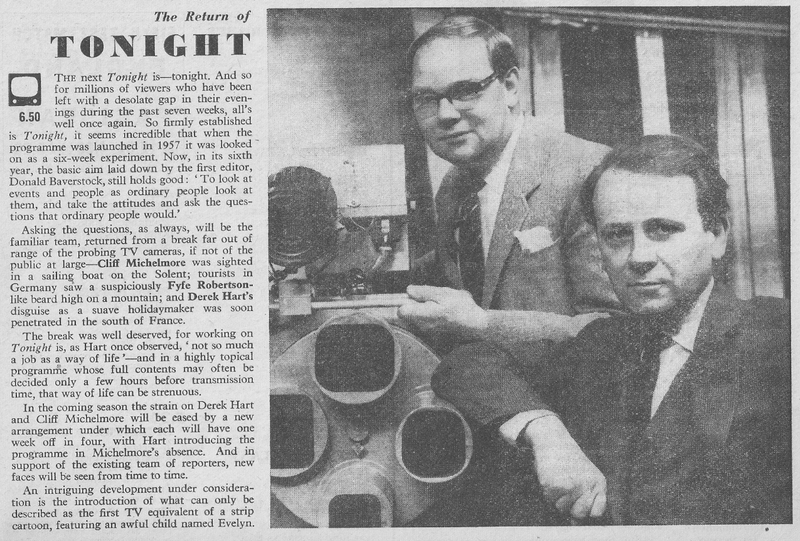 Crucially the use of filmed reports was to be an important element, a decision which led to the launching of the TV careers of Alan Whicker, Trevor Philpott and Fyffe Robertson. All this was promised on a very low budget of between £200 and £300 per day. Plus, as Lime Gove was unable to accommodate the expanded show, a temporary home was found in the old Marconi Studios in St Mary Abbott's Place in Kensington - a studio that had recently been vacated by ATV. 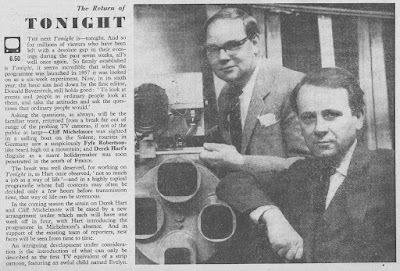 Cliff introduced the first edition of Tonight on Monday 18 February 1957. It had a specially composed sig tune, Tonight and Very Night, written by Felix de Wolfe. The packed running order included the draw for the FA Cup, a press review by John Metcalf, Cy Grant with a topical calypso penned by Bernard Levin of all people, actor Derek Bond telling the story of 'Bulbous Betty' the statue of Aphrodite that was offending people in Richmond Park, Derek Hart interviewing the great Ed Murrow and (intriguingly) Jonathan Miller giving his impressions of shops in Charing Cross Road. Appearing for the best part of an hour each night Cliff would become a household name, a kind of TV everyman. The Evening Standard likened him to being "the John Bull of the Small Screen" It went on to say "this avuncular pink-faced middle-brow with middle-class accent, occasional squeak in the voice and mid-as-cocoa manner has a very warm place in the hearts of millions of Britons". Behind the scenes he was well-liked by colleagues but apparently "he was not easy to get on with; he could be prickly and he did have bursts of temper, but these never lasted long." Tonight ended its run in June 1965 but Cliff was soon back as main presenter of BBC1's new current affairs programme, Twenty-Four Hours, broadcast on weeknights at 10.30 pm - so in some ways a forerunner to Newsnight. He was cutting back on his radio work, reports for the West region and football commentaries for the Light Programme, but was still much in evidence on the telly: "One way or another I got caught up in the Cuban missile crisis, General Elections, Olympic Games, early space shots, Royal Investitures, Hungary and Czechoslovakia, Concorde's maiden flights, the Apollo Moon programme." Cliff was chosen to anchor the programme with the biggest worldwide audience (at the time), the Our World satellite link-up of 25 June 1967 that pulled in at least 400 million viewers, some estimates say 700 million. 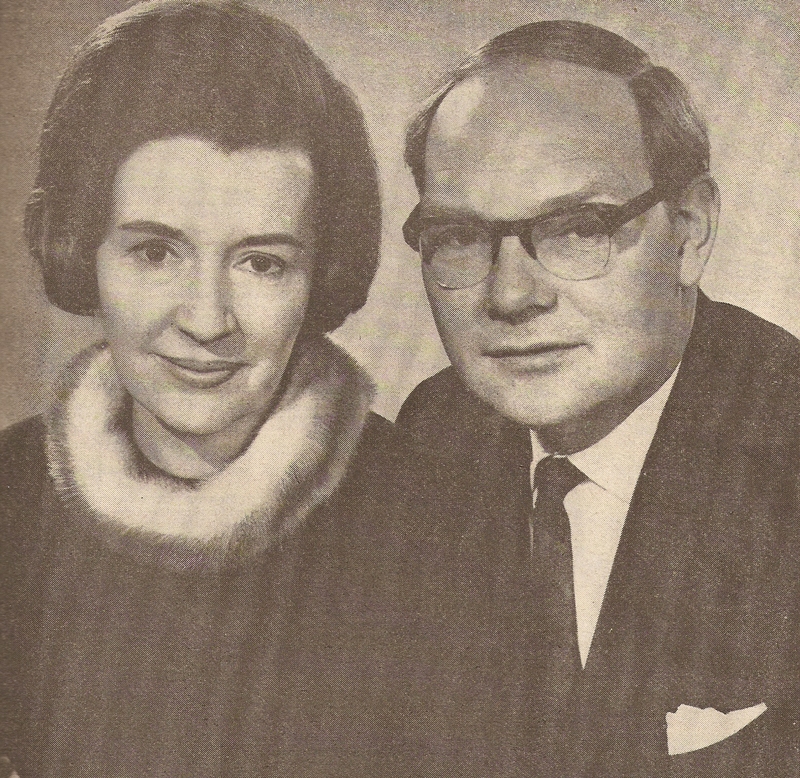 In July 1968 Cliff left Twenty-Four Hours (the programme continued with Kenneth Allsop and Michael Barrett and later David Dimbleby by which time its title had slimmed down to 24 Hours). Ostensibly he left to "settle for a more predictable lifestyle" which would allow more time with the family. In fact he was also planning to move into industry and set up a corporate video programme production, as a subsidiary of EMI, with Gordon Reece. However, a return to TV was not far away. The edition of the Radio Times that ushered in 1969 was packed with the usual holiday ads: JetSet holidays offering 15 days in Majorca for £35.10.0, Hoverlloyd with Ramsgate to Calais in 40 minutes for £10 plus a new weekly column from travel writer John Carter. Meanwhile the centre colour pages showed the Michelmore family on holiday, in Scotland and on the Isle of Wight, though they had plans to visit Canada. All this was to promote the new BBC1 series Holiday 69, designed to "take the worry out of your holiday planning". The first edition covered the increasingly popular package holidays, week two looked at holiday camps. For the next seventeen years Cliff was the trusted programme host, offering viewers a mix of exotic, and not so exotic, travelogues plus a dose of consumer advice. Here, in 1994, he returned to the programme when it celebrated its 25th anniversary. The presenter at the time was Jill Dando. After Twenty-Four Hours Cliff didn't leave current affairs entirely. In 1980 and 1981 he was one of the presenters of Southern TV's regional news show Day by Day. It wasn't an entirely happy period as the commute to the studio's in Southampton proved exhausting. Throughout the 1980s and 1990s Cliff returned to radio. In 1982 and 1983 he sat in for both Jimmy Young and Ed Stewart on their Radio 2 shows. The latter now included a Family Favourites feature so it was full circle. There was Waterlines (1984-92), a sort of aquatic Going Places, on Radio 4 (later transferring to Radio 5) and Coastline (1991-92) also on Radio 4. He took over as chair from David Hamilton of Radio 2's nostalgia based quiz Some of These Days (1986-91). His last regular series was again mining a nostalgia seam in A Year to Remember. Since Jean Metcalfe's death in 2000, Cliff's media appearances were infrequent. He was last seen on TV on BBC Parliament's 2007 theme night The Pound in Your Pocket and in 2009 he was reading listener's news on iPM. In 1984 Cliff suffered a suspected heart attack which caused him to take stock of his life. In the joint autobiography Two-Way Story he imagined what his obituaries might read like: "They might say I had been extremely fortunate to have achieved a measure of success in broadcasting in spite of lacking the intellectual powers and education of some of my contemporaries and the physical attributes of others. Hopefully they would add that I was greatly blessed by the love of a wife and family who, with good humour and tolerance, overlooked, and even ignored, the deficiencies in my character." "The next Tonight will be tomorrow night, until then good night."